Our hardback book is available to buy for just £29.97. However, if you request a FREE no-obligation meeting with us, we’ll give you a FREE copy. 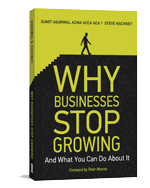 You’ll find the book an invaluable aid both to your Business growth and the financial challenges every business faces during its lifetime. A unique insight into the factors that contribute to the slowing down of growth of many owner-managed businesses. A time-tested and proven blueprint to rapidly grow your business. With growth comes growing pains. This final section looks at proven ways to financially manage the growth of your business, with particular attention on cash-flow and profitability. To get your FREE copy of the book simply watch the video on the right of this page, and then complete your details, or phone us on 020 8903 6330 to arrange your meeting. At the end of the meeting we’ll sign the book and hand it over to you (whether you decide to become a client or not). If you’re not ready to meet with us just yet but you would like to buy the book (which we strongly recommend) simply phone us on 020 8903 6330 and we’ll take your payment details and mail the book to you.